A common topic when talking about attic ventilation is how difficult it is to keep cool in the summer. Did you know attic ventilation is important year round? In the summer, allowing your attic to “breath” aids your central cooling system in working more efficiently by releasing some of the accumulated summer heat at night, and helping your air conditioner to cool your house more effectively. The result of good summer ventilation would be a more comfortable indoor environment and saving money on your air conditioning operations by allowing your home to cool naturally. In the winter the same principle applies with an entirely different concern. If your attic does not have proper ventilation the temperature can be much warmer inside than outside. With the combination of warmer attic air and the snow on your roof, the excess attic heat under the snow causes melting. This water is trapped under the snow and an ice barrier (Ice Damming), and cannot drain leading to it leaking into your attic damaging insulation, walls, ceilings and more. 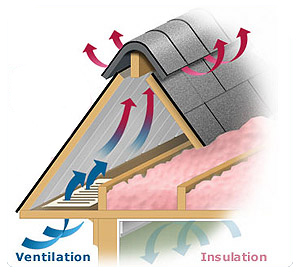 Proper attic ventilation also helps maintain humidity levels which has its own range of damages and health risks. Soffit Vents are typically matched with another type of Roof Vent or Gable Vent to allow for maximum attic ventilation reducing energy needs and risk of damage to your home. When considering a remodel or re-roofing job, talk to your contractor about your ventilation needs and the condition of your existing passive ventilation as part of your long term maintenance plan.